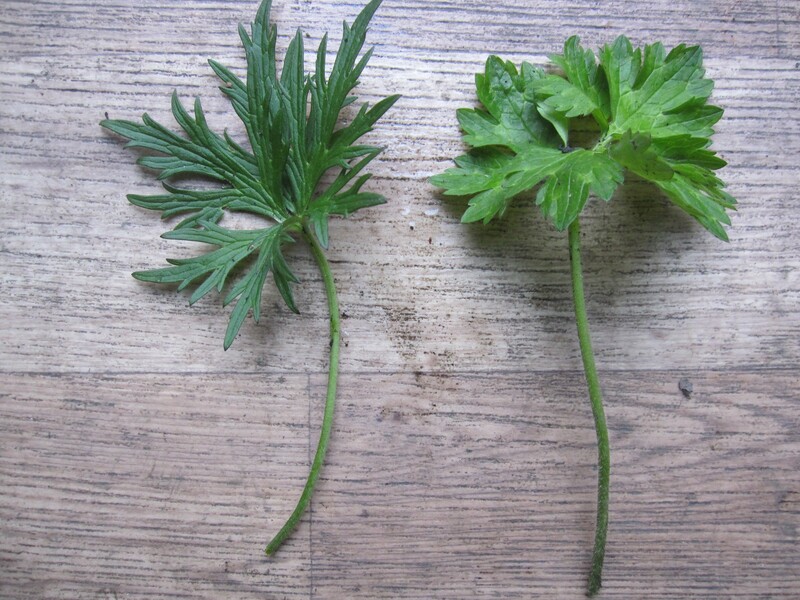 In the last post I said there I couldn’t find any Bulbous Buttercup Ranunculus bulbosus. The next day i found this specimen by the bank of the River Rhymney at Ystrad Mynach. 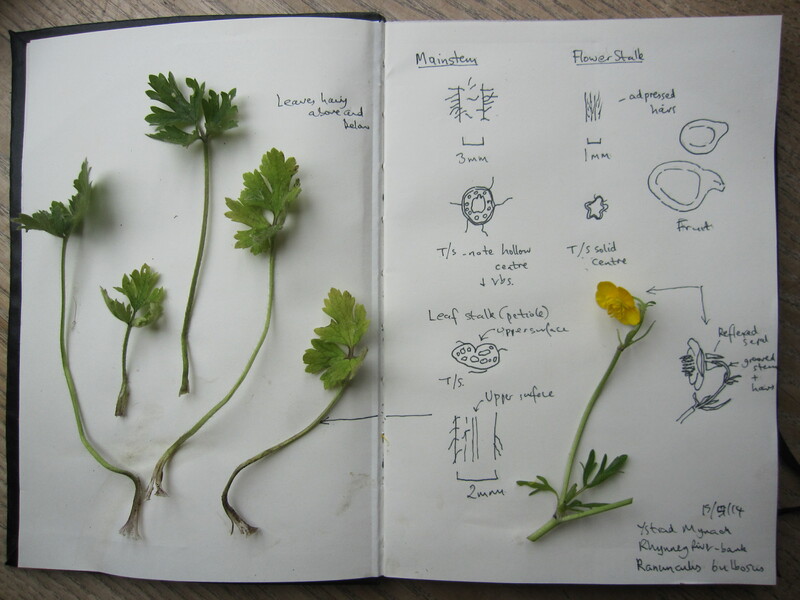 Unlike the other common yellow buttercups this one has reflexed sepals and a bulbous corm just below ground level. Otherwise it looks most like a more delicate version of R repens but (because it does not spread by stolons) has a different growth habit. Buttercups are one of the most common showy flowering plant groups but perhaps not as straightforward to identify as it would seem. 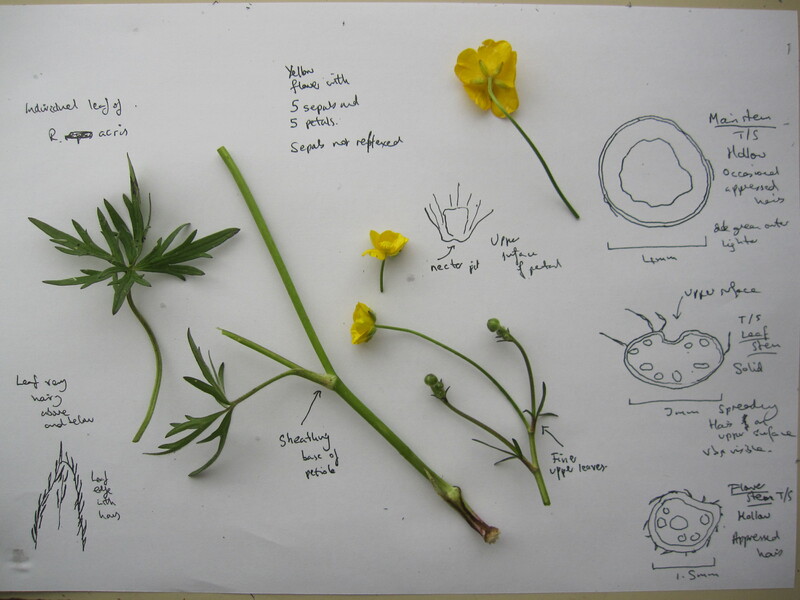 There are 3 main species of yellow meadow buttercup which we are likely to come across; Creeping Buttercup R repens, Meadow Buttercup R acris and Bulbous Buttercup R bulbosus. 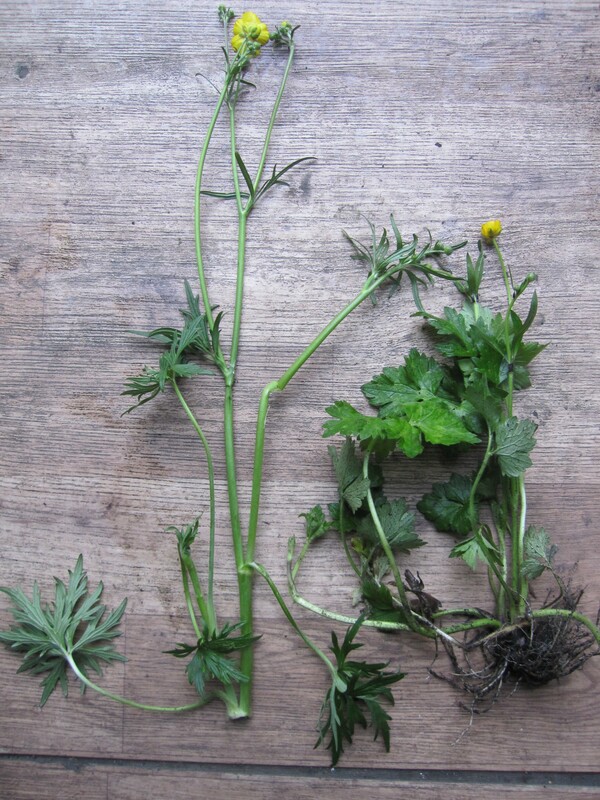 They all have yellow 5 petalled flowers and palmately lobed leaves and can be found growing alongside each other. R bulbosus is probably most distinctive when in flower because it has reflexed sepals (turned back to the flowering stem) although the flowering season is short. However R bulbosus prefers neutral to acid soils and as where I live is mainly acid and highly disturbed I have not yet seen one. 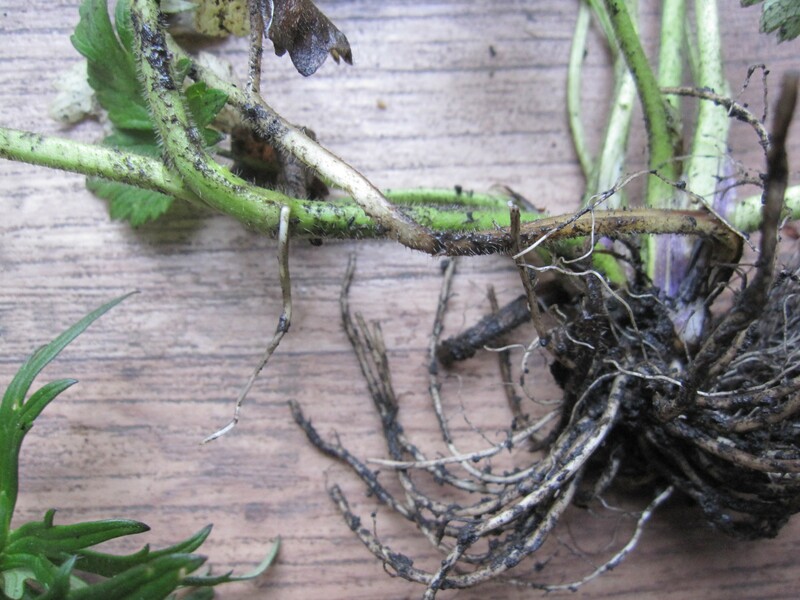 One of the key diagnostic features used by Streeter and Stace is that R repens has stolons that creep along the surface of the ground sending out occasional roots. This is the feature that gives the plant its name but it does not mean that every specimen will have rooting stolons although in overall appearance the plant will want to spread and clone to cover a large area. 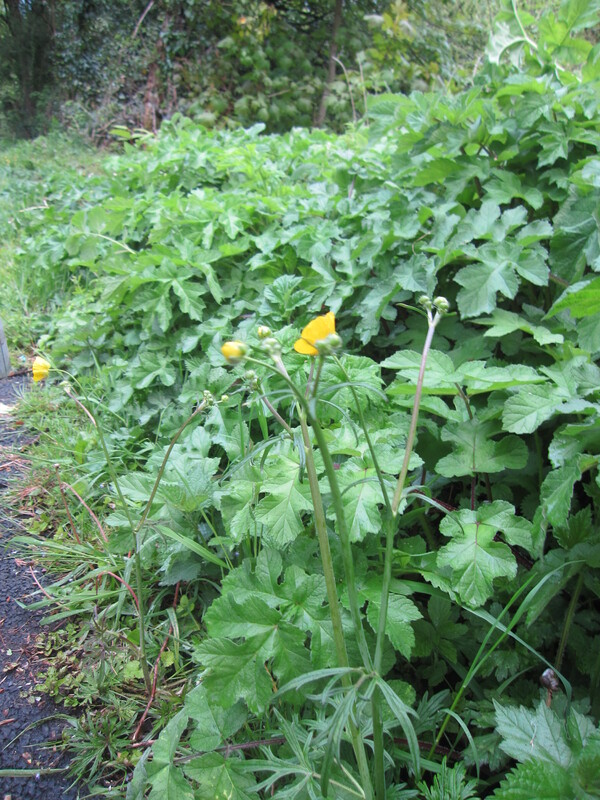 The other yellow buttercup of the verges is R acris. 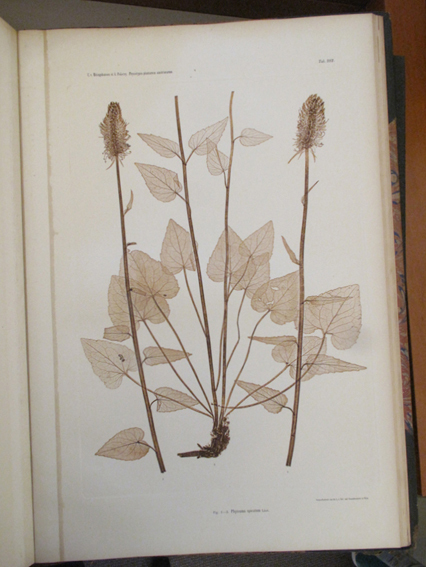 The flower is very similar to R repens but the lower leaves are more delicate and very deeply divided and the plant has a more upright habit with the flowers sitting above the rest of the plant. Sometimes the R repens will have mottled pattern on the upper surface of the leaf though this is also a feature of R bulbosus. 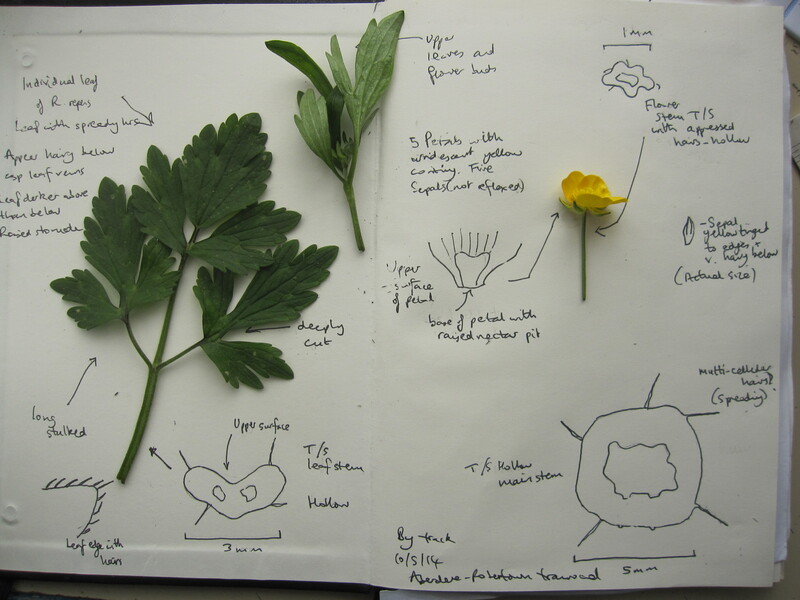 However it can be more confusing than it appears, and the plant crib notes that in grazed grassland it can be difficult to differentiate between the three species as all display much variation in leaf shape and size. A couple of months ago I looked briefly at some of the weeds growing on a well cultivated part of the allotment and found that though there was a range of plant families, the most common species was Veronica persica. This photo shows a the inhabitants of a more established bed that had not been weeded for a few years. 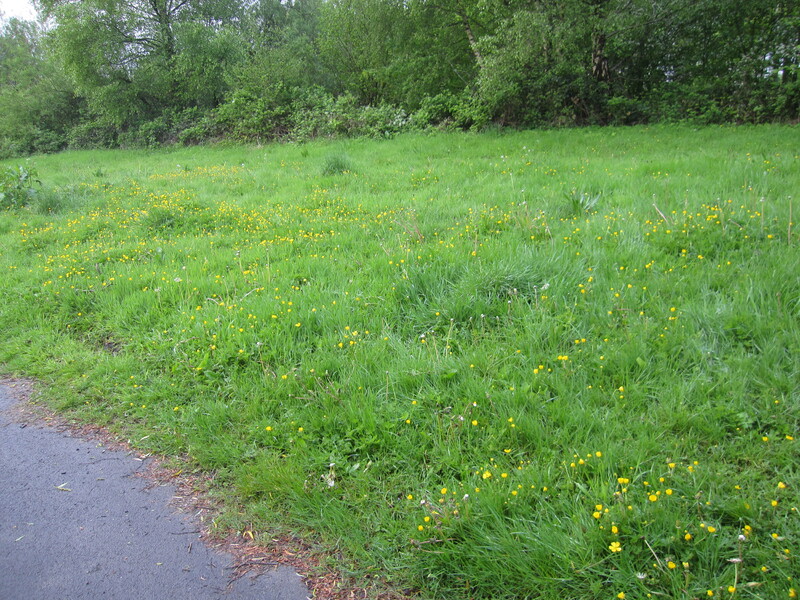 From the left there is Couch Grass or Twitch Elytrigia repens, Dandelion Taraxacum agg, Dock (probably Rumex obtusifolius), Creeping Cinquefoil Potentilla reptans and Creeping Buttercup Ranunculus repens. 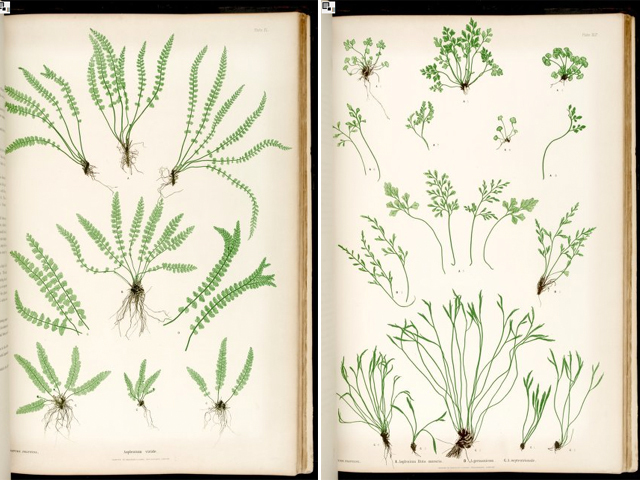 Not shown is the ubiquitous Horsetail Equisetum arvense. V persica is hardly present and the title for the most apparently dominant plant is now taken by Potentilla reptans. This chap is incredibly difficult to weed because it tends to break off at the surface leaving the tough wiry roots behind. 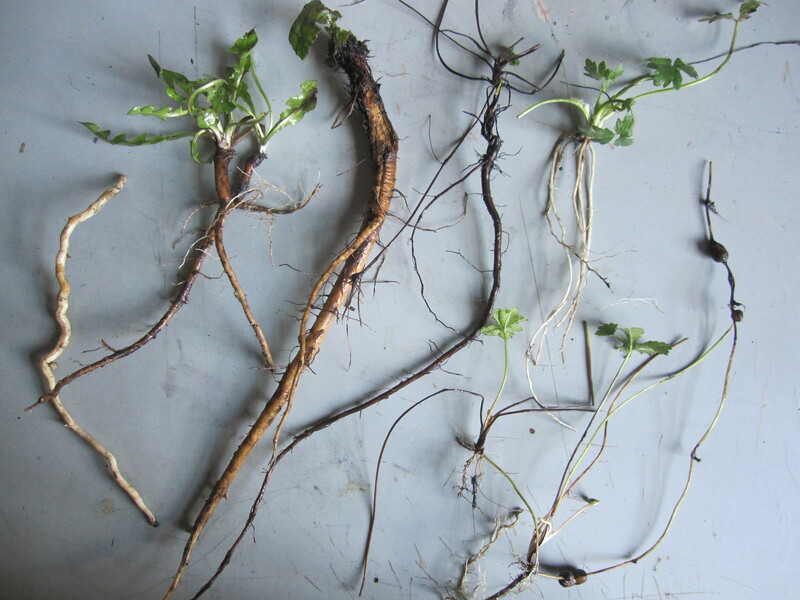 It spreads rapidly with runners that root readily where they land and it ingratiates itself with garden plants so that the two cannot be separated. The use of runners is a strategy common amongst the Rose family (Rosaceae), for example bramble, but it is used successfully by other families. Ranunculus repens (Ranunculaceae) spreads in much the same way.